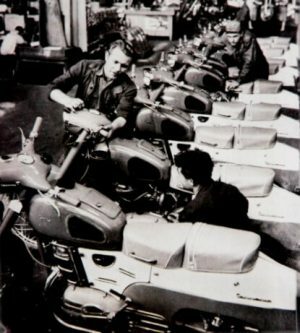 The history of motorcycles from the centre of the Hungarian capital (Csepel Island): The nationalized Weiss Manfred Works, which were renamed to Csepel Works according to the production location on the Csepel Island, produced motorcycles with the brand name Danuvia and Pannonia. These motorcycles were not only popular and well-known in Hungary but also abroad. The Manfred Weiss Steel and Metal Works started the production of bicycles in 1928, soon after that the production of motorcycles started as well. The “red or cigar tank” of 100 ccm with a single cylinder, two-stroke engine had already been for sale since 1931. Thanks to its popularity, the small motorcycle could be driven without a driving license. The red tankers constructed in the former bicycle works were constantly further developed. The production of its successor, the 86 ccm Turan, started in 1935. The next type change took place in 1937 but this time 100 ccm as well, without gears. The motorcycle that became well-known as Nickel tank was produced in greater quantities than its predecessor. There were slightly more than 10.000 WM motorcycles – out of which 7.500 nickel tanks- licensed during the two world wars. The production of motorcycles began after the destruction of the world war in 1947 again. The first type, the VM Csepel 100 Tura got known with a modernized engine block. A team led by Aurel Jurek started to plan the new 100 and 125 Csepel during the production of 100 Tura. The new 100/48 g with three-speed gear was born. 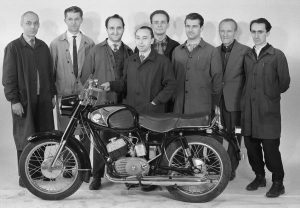 Furthermore, another important development took place in 1949: the model 125 emerged and it was produced until the end of the production of Danuvia (1966) in the local motorcycle industry. In the summer of 1949 the new 250 Csepel double-piston construction was developed, which was the work of the construction team led by Aurel Jurek. The model after the Puch-system was introduced as Csepel 250/U in the production for two years from 1950 to 1951. No more Csepel 100 was produced, only the Csepel 125 remained. After common delays and difficulties the first big series of Csepel 250 came into being, which was a single-piston type. 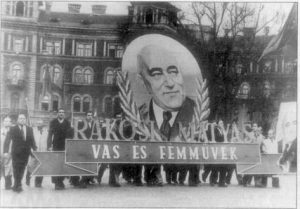 One part of the WM-construction was renamed by the legal successor and got the name Matyas Rakosi Iron- and Steelworks. Meanwhile, the Csepel 125 was equipped with a telescopic fork in the front and suspension strut in the back, this way it became more comfortable. The Csepel 125/T produced between 1951-1955 was the first Hungarian motorcycle built in a big series, out of which approximately 50 000 were made. 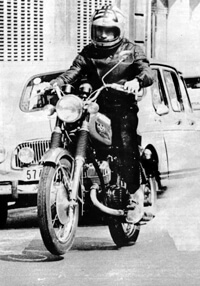 The extension of the motorcycle offers had an important political meaning in 1958. 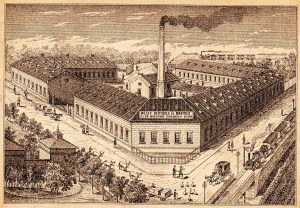 The motorcycle construction was merged with the mass production plant because of the fact that Pannonia was considered as scarce commodity on the domestic market. The significant increase of the cutting and press capacity was good for the serial production but the delivery of spare parts stayed out. This way the planned introduction of the new models slowed down or in some cases it did not happen. The long expected big moped Tünde with its 175 cm3 engine appeared beside the TLF version developed further by TLT between 1958-1961. The plant manufactured a covered edition of Pannonia with the name TLB for two years, from 1960. This was a luxurious type during that time. A politician thought that it was only a waste of money to build in so much metal into a motorcycle. Pannonia started to export to the Soviet Union in 1960. This relationship served an important function later; it gave the opportunity to produce approximately 40.000 pieces a year. On the other hand, it was a disadvantage for the plant because the Soviet partner did not desire the improvement and the modernisation of the models, which had the consequence that the technical improvement of Pannonia lagged behind the requirements of his time. Japanese models appeared on the European market in the early 1960s. This technical improvement and trend were seen in Csepel and a parallel two-cylinder-model-prototype was released in 1963. They gave up the production of bridge frames and copied the Yamaha 250-YDS more or less thoroughly instead. The form of the new two-cylinder prototype was designed by Jenő Jurek. 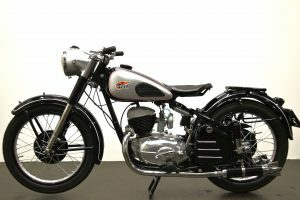 Everyone hoped after the introduction of the model P20 that it could be the big breakthrough of the Csepel motorcycle works. The necessary money promised for the investment did not come this time so the production of this model began only 3 years later. They ran into serious difficulties in terms of technical executives and employees. P 20 with its engine of high tolerance was one of the best Eastern European models; however, because of the lack of quality it was not appropriate for the Western market. Between 1960-1965 the company tried to export the TLF-successor T1 to Western Europe. The increase of compression, a new cylinder head and noise reduction made it possible to create a powerful and efficient motorcycle. This model in the following power classes –T5, T6, T7, T8, T9 was delivered to markets like Great-Britain, France, USA (with the name White), Sweden and Indonesia. It was obvious for the chief executive that the motorcycle plant could not produce competitive models in the 1970s without considerable investments, which made the Csepel Works and the Ministry of Metallurgy and Engineering face a crucial decision. Finally, the production change seemed to be the only possible solution. The Soviet Union revised the purchase warranty, the consequences for the domestic market, these were unfavourable for Csepel. At the beginning of the 1970s a series of prototypes were planned with the result that the technical employees of the plant could work for possible alternatives and improvement. The models P125 and P175, T250, P350, the P11 and P24 were all interesting innovative products, with which considerable success could have been achieved. The T5, P10 and P20 remained instead. The latter was supposed to be an export version for France and Germany. This way from the P20 a slight modified concept, the P21, was made. The slightly modernised P12 – instead of P10 – appeared with unmistakable characters, in yellow and red in 1974. In the following years T5, P12 and P21 models were manufactured. On the last day of production, on 24th October 1975 the T5 was made for export. To its memory, P21 was exhibited as a dignified farewell to the motorcycle with a 44-year-long history in the museum of the plant.